Well there has been a lot of changes in the system over the past couple of days. I’ve been trying to move everything out of the temporary tanks and into its permanent home. I guess that was a little too much change for the mantis shrimp. He’s been living in the refugium attached to the new system for a couple weeks now. He recently molted over a period of two or three days and in a matter of a couple hours after he was finished, he died. Not sure if it was too much action from the move or if he had a rough molt. We’ve had him for a little over three years but from what I read, they can potentially live for up to twenty years. Mantis Shrimp (Gonodactylaceus ternatensis) living in 2 inch PVC pipe. Remains of the mantis shrimp molting process. Well, over the past couple of weeks we have been doing a lot of moving! 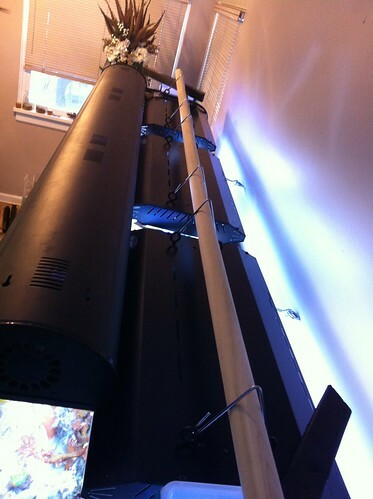 In the new house I’ve setup a temp system (300 gallon Rubbermaid stock tank + 90 gallon) and started on the new stand/room with help from my good friend Cliff. Every part of moving seems slow and painful. Still living out of boxes and not sure where anything is but the fish project must go on! Here are a few pictures of the progress. The wall in the beginning. Adding electrical and a false ceiling. Wanted to make sure we could wall of the moisture if it stared some rust issues on the water pipes. Getting the blue board put up. Good bones for the fish tank stand! Sheeting the outside of the stand, will show some finished pics later. Finishing the inside of the stand with blue board. Listen for it… Crack! Every time I hear this I go to make sure he’s not hitting the tank. 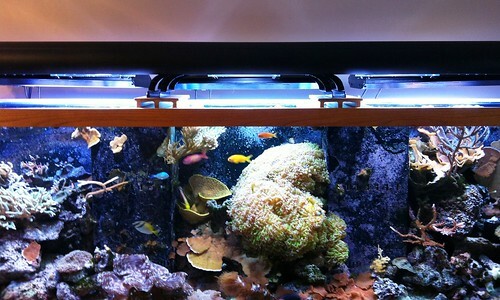 Thankfully the 90 refugium is made out of half-inch glass. 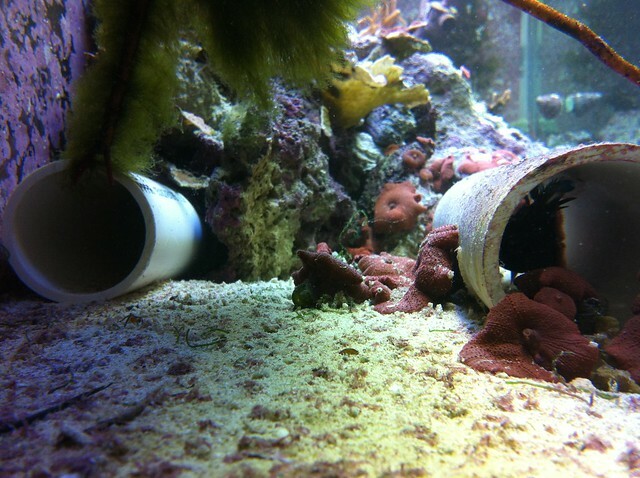 The Mantis Shrimp new cave system has been installed. 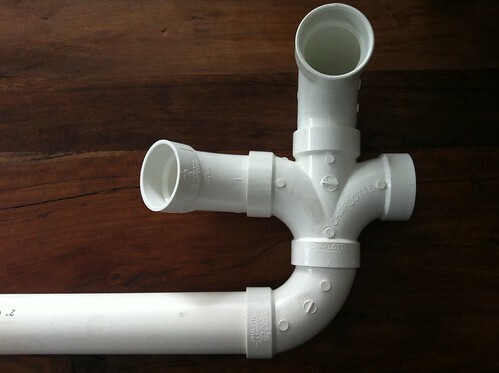 My last post shows just the PVC. He stayed in his old tube the whole time I was doing construction. Oh and here are a couple pictures of the new T5 bulbs installed and raised up 7 inches for the break-in period. Just getting ready to change out my T5 bulbs. Also changing the way the T5’s sit on the tank. Replacing the blocks of wood for a hanging system as I think it will make it a little easier to clean salt creep. 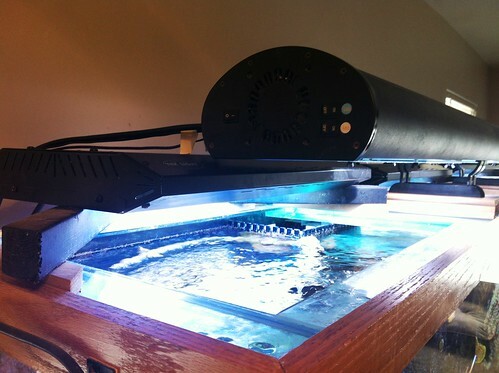 More pictures later after I install the above in the refugium. 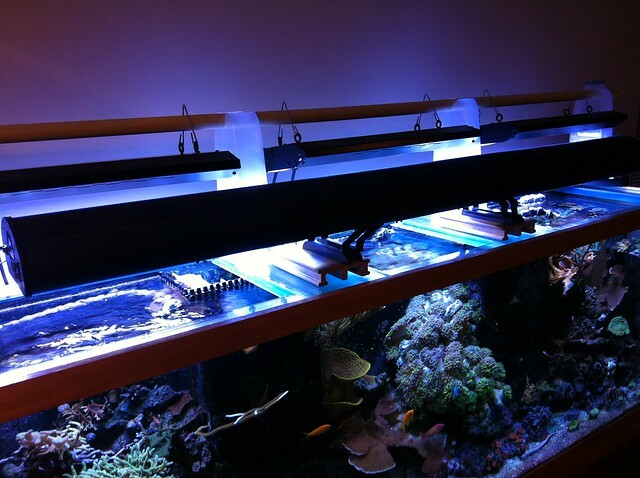 Well it was a somewhat productive weekend… I changed out my BRS RO/DI filters, replaced a bad ballast and (noisy) 3″ fan in my Current Metal Halide fixture, fixed a melted LED wire and cleaned the coralline algae off my glass. 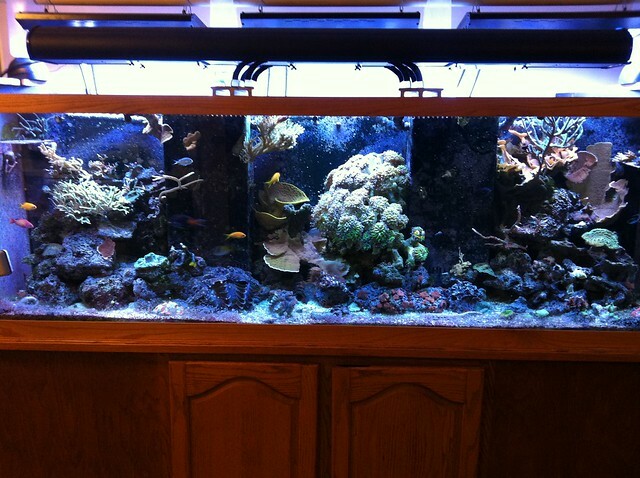 I still need to clean the refugium… maybe today. This LED wire made its way into the metal halide area and melted. The MH ballast was not firing all the time so it was time to be changed. Glad I had the correct screw driver. Time to put it back together. I also just had a guy on YouTube point out that mantis shrimp might not be a peacock but a Gonodactylaceus ternatensis (Google image search). 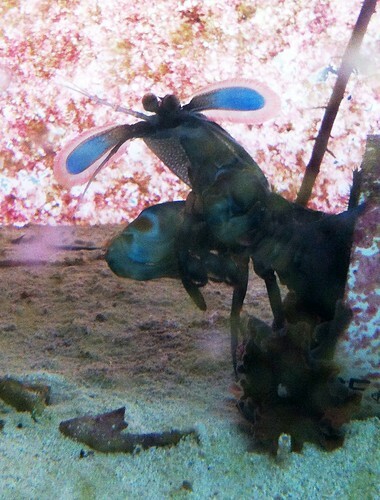 I think I tend to agree with him as the mantis shrimp has lost a lot of the red it used to have. After I clean up the refuge glass I will try to get some better pictures. Quick video of our Peacock Mantis Shrimp (Odontodactylus scyllarus) feeding. I’m really happy that he’s coming out more and wandering around the refugium. Hopefully he will start eating the baby peppermint shrimp. I recently pulled a bunch of algae out of the refuge and thought I would take a couple update photos. The peacock mantis shrimp is the only creature living in the refugium. He pretty much lives in a conch shell buried in the rocks on the right side of the tank. 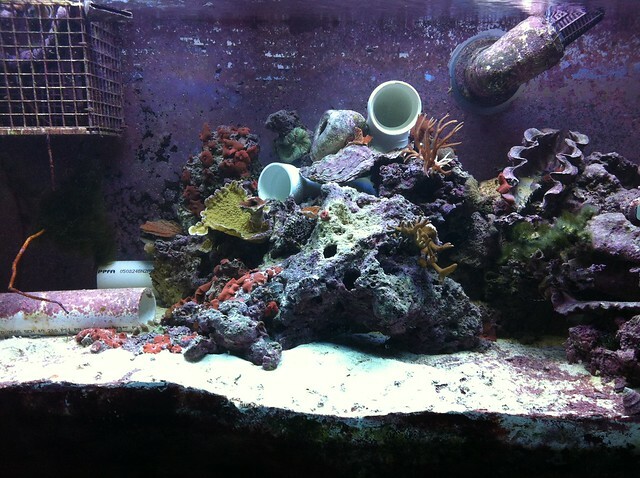 He often chops off pieces of SPS coral to build with, lol. Since the damselfish removal the bug population has exploded! I’m really happy to have the bugs/pods back! Our Peacock Mantis Shrimp (Odontodactylus scyllarus) has been more readily coming out to feed lately. When he darts out to eat his piece of shrimp I can see how much he’s grown! 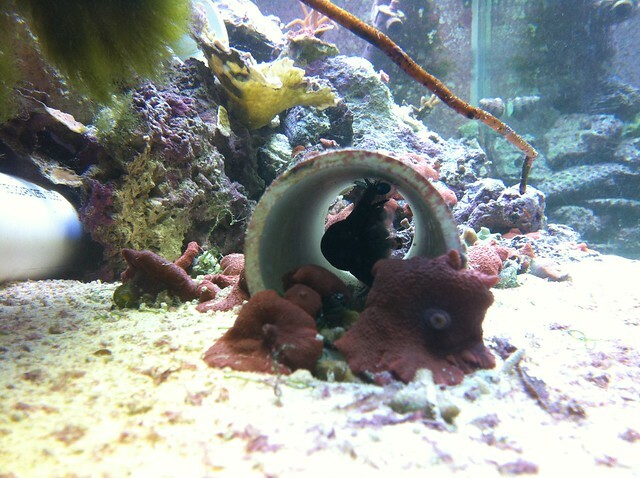 With the removal of the damselfish from the tank, maybe he will be out exploring more. 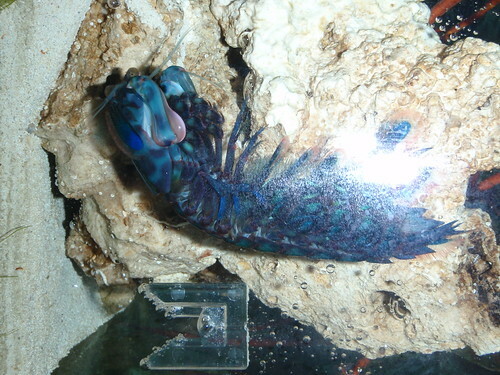 Here are a couple pictures and a video of our Mantis Shrimp ( Gonodactylaceus ternatensis). We’ve had him for a little over a year now and he lives in our 90 gallon refugium. He has molted twice within the past three months and has gotten quite a bit bigger! Right now he’s probably 5 inches long but noticeably more girthy than before. He “shucks” his shell into the tank and hides for about a week until his new coat of armor has hardened. This morning I found one of his “smashers” sitting outside of his conch shell. The right side of the smasher (below) it the hammer part he uses to open up crustaceans and break things. About six months ago we put an octopus in our refugium which caused the mantis to reevaluate his current living arrangements which gave me the chance to take the picture below. The octopus soon laid eggs and perished. Since our refuge runs on a reverse light cycle, I don’t get to see the mantis shrimp as often as I would like but he has a damsel in the tank to keep him company.